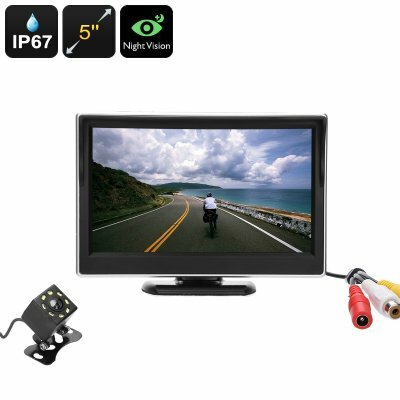 Successfully Added Rearview Backup Parking Camera Kit - 1/4 Inch Color CMOS, IP67 Camera, 5 Inch Display, Nigh Vision, 120 Degree Lens to your Shopping Cart. Never struggle with parking again thanks to this rear view backup parking camera and 5 inch monitor. Day or night, rain or shine this car backup camera and monitor kit makes parking a doddle. The 5 inch TFT LCD monitor in this car camera kit has 2 video inputs so when its not being used for parking it can be connected to your GPS system, car DVR or media player and used as an extra easy to view display. The rear view camera uses a PC7070 image sensor and has an IP67 waterproof rating so no matter the conditions it will bring excellent views without you having to crane your neck. A wide viewing angle of 120 degrees horizontally and 80 degrees vertically means there are no more blind spots or trouble from low obstacles as the backup camera in this kit can capture everything behind you. With 8 LEDs the camera can be used night or day and will let you see the area in its immediate vicinity even in pitch blackness. This kit includes all the cables and connectors you need including camera cabling and two power cable options as well as adhesive pads and screws making it easy to mount the camera inside or out. This rearview parking camera comes with 12 months warranty, brought to you by the leader in electronic devices as well as wholesale car cameras and parking monitors..